Following the guide book written by Dawson in 1952 to mark the quincentenery of Deane Church, and its various revisions in 1957, 1964 and 1969 it was decided to completely rewrite the information in a more modern style. 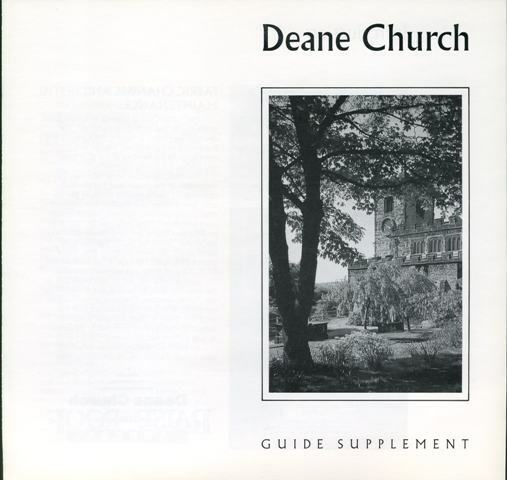 The 1986 guide brought new life to the history of Deane Church, and in time honoured tradition there were things that needed bringing up to date in 1993.A transcript (11Kb) and a scanned (21Mb) version are available for download. Seven eventful years have passed since the current Deane Church Guide was published contemporaneously with the 1986 Flower Festival. During that time many developments and changes have been implemented and it seems timely, on the occasion of our 1993 Flower Festival, that this updating supplement should be prepared. This also presents an opportunity to correct a number of errors which inadvertently occurred in the original guide and these are listed as an erratum at the conclusion of the notes. The Hulton Door is referred to several times in the Guide, see page 23 in particular. The decision was taken to resolve this curiosity and the sealing of the doorway was recently completed with the removal of the door itself and adding the infilling stonework. The most significant work has been the restoration of the church roof, the previous roof-covering having passed its useful life. An extensive recovering of the roof with stainless steel panels and also some stonework repairs were completed in the latter part of 1992 after an extensive 'Giving' and fundraising effort under the banner "Raise the Roof". The Giving by parishioners has been generous and, with a grant from English Heritage, it has enabled the £125,000 cost to be met without borrowing. Less spectacular, but no less important, is the ongoing repair, re-leading and protection to the church windows. This work is continuously necessary to ensure the preservation of the windows, many of great antiquity, which are subject to deterioration from, sadly, vandalism as well as from natural causes. An alarm system and smoke detectors were installed within the church during 1991. The more obvious changes within the church over recent years include: The new bookcases against the wardens' pews at the rear of the church. These were made from timber recovered from previously removed pews and are a memorial to former Church Warden and Treasurer, Major Crook. The fitting of the new red carpet throughout the church. The re-arrangements to the Hulton Chapel, most notably the new electronic piano. The flags and banners are now transferred to the west end of the church and, since the photograph on page 16 of the Guide, access has been formed between the chapel and the south aisle. The White Ensign from Rear Admiral Hulton's flagship HMS Hercules is now in place. The ornate Altar Cross, as illustrated on the contents page, was stolen and has been replaced with the illustrated simpler cross. Also, the previous lectern Bible was vandalised and has been replaced with a new Bible dedicated to the memory of Harold Sutcliffe. The illustrated new portable Font has been carved from removed pew timbers by Simon Corbyn, the brother of a former curate. It is normally located in the Hulton Chapel and brought into the Chancel for Baptisms. The Funeral Hatchments have been restored by the Blackburn Museum and Art Galleries Service with the help of grant aid from the Council for the Care of Churches. The Hatchments now look magnificent as does the original Royal Coat of Arms located above the North Door. A number of spelling/printing errors were noted in the original Guide, however the readers patience will not be tried with a listing of these errors which will hopefully be rectified in a future edition of the Guide. Page 12	The total cost of the 1986 restoration was £95,000. Page 13	The restored Royal Coat of Arms is now located above the North Door. Page 15	the East Window was erected in 1845. Page 17	As stated earlier, the Hatchments have now been restored. Page 21	The current simple clock face was fitted in the early 1980's. We hope that these additional notes, read in conjunction with the Church Guide, will bring the reader up to date with the continuing work for the preservation of God's House in Deane.